The picture above shows a 15x10 rectangle made from the 25 one-sided notched 2x3-hexominoes. The pieces were cut from white hard foam board with transparent labels attached. Using sets of pieces with different numbers of notches some construction of rectangles and rings with square symmetry are possible and mentioned in the following table. The 15 two-sided 2x3-hexominoes with two notches can cover a 5x18 and a 6x15 rectangle, but an exhaustive search showed that you can't fill a 8x9 rectangle. All rectangles with a height greater or equal 6 can also be covered and the solutions are here. If you try to construct a rectangle with height 4 all pieces must have one long side without notches, but this doesn't apply to all pieces. It's rather hard to work with the 60 two-sided 2x3-hoxominoes with 4 notches, because there are only 5 pieces that fit into the corners of a rectangle. Reserving 4 of these pieces for the corner there are 15 pieces left with at least on long side without notches. 30 other pieces can contribute one of their short sides to the border. In total we have 4*5 + 15*3 +30*2 = 125 units for the borders. Covering the corners first I got solutions for the 10x36m 12x30, 15x24 and 18x20 rectangles. The 6x60 rectangle can't be solved because it has a total border length of 132. The 8x45 rectangle has a total border length of 106 and it was a little bit difficult to get a solution. My old computer had to work some hours. For the 19²-1² ring I also had to wait some time. I think the chosen partition wasn't optimal. There are 25 one-sided 2x3-hoxominoes with two notches and they can cover rectangles of size 10x15 and 5x30. The first is shown in the title, the second is here. Why is a construction for the 6x25 rectangle impossible? Let's have a look at the pieces. We assume, that there is a 25x6 rectangle covered by these pieces. The whole rectangle can be cut into 2x6 vertical and 3x6 horizontal blocks each filled with 2 vertical or 3 horizontal hexominoes, respectively. Now we can see that the red pieces must be oriented like shown, because there is no other piece to match if they are turned by 90 degree. For the yellow pieces the orientation is also fixed and for the pink pieces it's only possible to turn both or none of them. 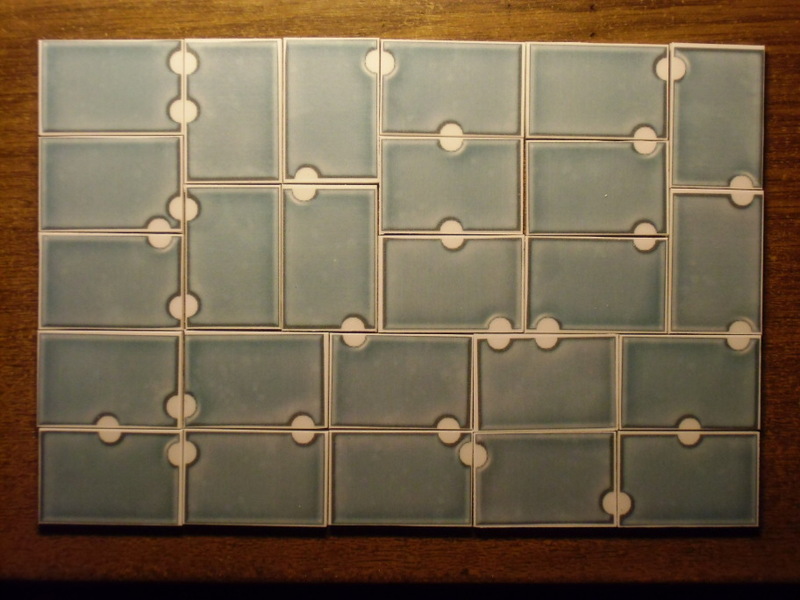 At the blue pieces there is a difference of 1 between the number of notches at opposite sides. For all other pieces the difference is even. If we fill a 2x6 block, we can use two blue pieces or two other pieces. In any case the difference between the number of notches at the left and right border is even. If we fill a 3x6 block with three horizontal pieces, we must also take two blue pieces or no blue piece at all. Again the difference between the number of notches at the left and the right is even. Since the whole rectangle has no notch at the short sides each separating line between two blocks must have an even number of notch pairs. This can't be true, because at least one piece taken from the pieces with number 15,16 or 21 must be combined with a green one getting a border with three notches. There are 60 one-sided 2x3-hexominoes with 3 notches. The total area is 360 and a lot of rectangles can be covered. In contrast to the 60 two-sided pieces with 4 notches there are enough pieces with straight long sides and it is possible to solve the 6x60 and even the 5x72 rectangle. The solutions for the 8x45, 10x36, 12x30, 15x24 and 18x20 rectangles are here. Three rings with square symmetry can also be constructed. The length of the border is no problem, but I had to divide the 19-1² ring into three smaller parts to restrict the search procedure.